The internet jury and readers of In de Strengen magazine, as well as the committee consisting of: Colonel Bert Wassenaar – stable master of Queen Beatrix, Board member Siem Korver and ‘In de Strengen’ editor/inspector Jacques Verkerk – voted unanimously for Nassau. The Indoctro son and his rider Jeroen Dubbeldam brought the Dutch to the spotlights of international jumping sport by way of earning a silver medal at the National Championships in Mierlo, a double bronze at the European Championships in San Patrignano and first place at the finals of the Samsung Super League in Barcelona. The KWPN stallion Nassau and rider Jeroen Dubbeldam entered the ring of the stallion show in ‘s Hertogenbosch accompanied by loud applause. 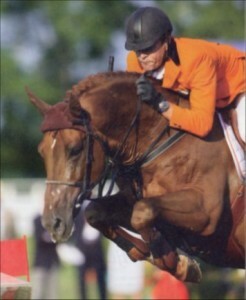 Several Nassau offspring were presented, including the approved stallion Thunderbolt and Vodieza, 2005 champion of the jumping mares in Gelderland and highest placed jumping mare at the National Mare Keuring.